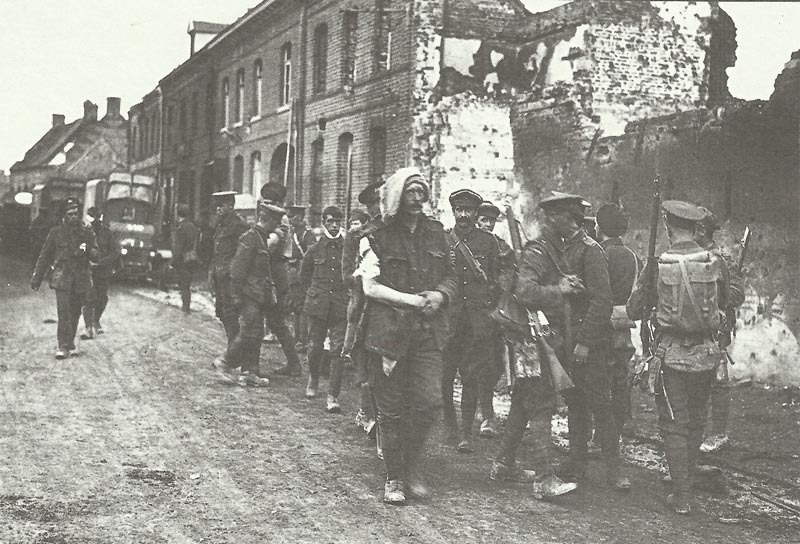 Picture from this day: British wounded through the streets of a shell-blasted town during the Battle of Loos. Loos: British fresh 46th (N Midland) Division captures main trench of Hohenzollern Redoubt, but 2 other divisions fail against the Quarries and Hulluch. War poet Captain Charles Sorley of Suffolk Regiment killed, aged 20. Britain – Most severe German airship raid by 5 Zeppelins (189 bombs of total 13,672 lb dropped): L 13 (Mathy), L 14 (Boeker) and L 15 (Breithaupt) bomb London (night 13/14; 149 casualties plus 50 casualties elsewhere). Western Front: Royal Flying Corps observers help silence German guns in 17 places on BEF First Army sector. Britain: Government breaks relations with Bulgaria. France: Foreign Minister Delcasse resigns because of Salonika expedition.